Having Used the TS 55 EQ for five years now, I was excited when Pro Tool Reviews asked me to test the new Festool TS 55 REQ Plunge Cut Track Saw. I am still more than happy with my TS 55 EQ, so it was interesting to find out how this iconic design could be improved. To give some background, Festool invented the track saw more than 40 years ago. While DeWalt, Makita and Grizzly now offer similar products, Festool is still the benchmark by which track saws are measured. Retrofit rail systems, such as EZ Track, are also available for garden-variety sidewinder saws; however, they are not all that cheap, so I would only resort to this scheme if I owned a compatible saw and had minimal need of a track saw. While DeWalt’s saw is comparably priced to the $585 TS 55 REQ, the others are cheaper. Festool also makes a bigger saw, the TS 75 EQ that fits the same track. While the 55 will cut to a depth of 1-15/16” (50 mm) when mounted on the guide rail, the 75 will handle 2-3/4” (70 mm). Track saws are of interest to trim carpenters and installation crews who can use them in the field in lieu of a table saw. Besides the accurate cutting of sheet goods, they allow precise, error free cutting of flooring for ductwork or repair. Small shops love track saws for breaking down sheet goods. They are much cheaper than a panel saw or a sliding table saw and do not take up any floor space when not in use. A good amount of Internet argument surrounds the question of a Festool TS 55 REQ Plunge Cut Track Saw replacing a table saw. It will, but it will never make some cuts as fat as a well set up table saw can. To really achieve table saw functionally, Festool envisions you also owning their Multi Function Table/3 (MFT/3), which costs $625. The MFT is a very solid portable workbench that has a miter gauge rail combination to facilitate 90°, angled or compound crosscuts. A friend who runs a custom cabinet operation in Asheville, North Carolina is using three MFT/3 tables in the shop for breaking down sheet goods. The track saw will also replace an edge jointer, for it leaves square, straight, glue-ready cuts. Since I do not own one of Festool’s Multifunction Tables, I have only used my TS 55 EQ on sawhorses and seldom use it off the track. I often use it as a jointer, and the Rail Connector Set in the Accessory Kit allows jointing two tracks together for really long straight edges. Being able to inline rip one edge of rough sawn boards really speeds conventional milling at the table saw and planer. Something you cannot do with a table saw is joint the long edge on an 8’ sheet. You end up stuck with whatever the plywood mill was turning out that day. The track makes it simple to make an 1/8” truing cut. With the aid of a set of horses it is a superb tool for cutting a stack of sheet goods. By placing 1/4” strips between sheets you can cut one or two sheets at a time because blade adjustment is so precise. While many simply score the horses on the last cut, I place strips on them as well. I really appreciated the Deflector as it minimized the hose and cord hanging up on the edge of the rail. Festool’s approved method of blind cutting, such as a cutout for a register, is to place down the track on a layout line. There are index marks, one on the side of the housing and another on the viewing window/splitter. The rear line on the housing is aligned with the start of the cutout. The Limit Stop is now attached to the rail, tight against the back of the base. The saw is started and plunged through the floor. The cut progresses forward until the stop line comes even with the mark on the splinter guard. I doubt many working trim carpenters bother with the stop, but it makes the operation really safe because a kickback is nearly impossible! The Limit Stop prevents the saw from kicking back when starting a blind cut. In long cuts on sheet goods you can simply lay the track on the work and have no fear of it moving during the cut; however, the two screw clamps in the Accessory Kit assure that the track is rock solid in situations where there is minimal contact area for the rubber on the bottom of the track to grip. They slip into a channel in the extrusion and lock against the bottom of the workpiece. The Angle Unit works well for aligning the track to a specific angle from an edge and this is another situation where clamps are good. The Parallel Guide Extension Set allows serial ripping of sheet goods and along with the MFT/3 is necessary to make the Festool TS 55 REQ Plunge Cut Track Saw truly replace a table saw. There are two short and two long bars in the set. A short bar is attached to a long bar to form left and right pairs. The pairs can remain together for life. The long bar allows exact parallel ripping of widths between 7-7/8” (190mm) and 25-15/16″ (650mm). The stop on each bar is set to the desired width of the rip in millimeters and placed against a trued edge. The rail is now clamped to the workpiece, and the saw does its magic again, again and again with unvarying accuracy. For ripping widths from zero to 9” (230 mm) the rail and attached bars are reversed. The stops need to be reversed as well. The scales on both the short and long bars need to be calibrated on the first use and checked periodically. For the short bar the 2.2 mm width of the blade must be allowed for. Once adjusted, the Parallel Guide Set works as advertised and makes quick work of serial ripping set widths. The stop on each rail can be set to the nearest millimeter to facilitate very accurate ripping with the TS 55 REQ. Festool claims a number of improvements in the REQ over the EQ. I found the new depth stop to be a definite improvement. It has dual scales: one for on-track depths and one for using the saw alone. On the TS 55 EQ you had to add 5 mm to the depth when employing the rail, and depth was to the nearest millimeter. While the old saw had a micro adjuster for depth it was only intended to adjust for blade diameter reduction after sharpening, and it required a hex key. The new one is tool-less and is intended for more than just accounting for the blade diameter. It allows depths between the millimeters for the flooring contractor who may not be not cutting all the way though the flooring at 19 mm, but is scoring concrete at 20 mm. Speaking of millimeters, I have long wondered why Festool does not offer their tools to the North American Market with scales in inches instead of millimeters. I am pleased to say that the new TS 55 REQ comes with a scale in inches that can be applied over the millimeter scale. 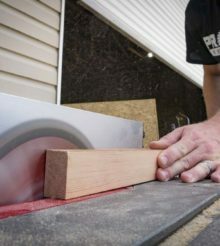 The plastic splinter guard on the track itself prevents splintering on the left side of a cut, and the plastic splinter guard on the right side of the saw prevents it on the right side of the cut. The splinter guards, be they on the rail or the saw, are consumables and need occasional replacement. The Festool TS 55 REQ Plunge Cut Track Saw comes with both a plastic viewing window and a splinter guard. Splinter guard replacements come in a pack of five. I only use the viewing window when the knob that holds the splinter guard on the right side of the saw prevents working close to an edge. The edge of the TS 55 EQ’s housing could not snug an edge, such as a wall, because there was a bulge for the dust pickup port. The port has been streamlined on the TS 55 REQ. As mentioned in the previous point, the splinter guard knob has to be removed and the plastic viewing window substituted. Closer cutting was an improvement mostly for the European market who do ceilings and wall panels that are trimmed shy of the adjoining wall. This so-called “false joint” gives the illusion that the ceiling or panel is floating. The riving knife on the REQ is also completely redesigned. It now pops out the minute you start lowering the blade and can be placed right in the kerf. The blade is now also put in the kerf and the track can now be tweaked to continue a long cut if you only have one track. While the TS 55 EQ went from 90° to 45°, the new saw goes from -1° to 47°. This allows an inclusive angle of 87°, so that outside corners meet flush in a miter such as boxing steel beams with wood. The claimed improvement in dust control (now listed as 98% from 92% on the TS 55 EQ) is from taking the riving knife completely out of the dust channel, as well as streamlining the channel itself. The plastic viewing window has two positions, as does the splinter guard. The higher efficiency is only achieved with the window/guard in the low position. I think that the TS 55 REQ offers significant improvements over the TS 55 EQ. The only perplexing feature that has not changed from the older saw is that in order to attach or un-attach the power cord you must often tilt the saw from 90°. I suppose we can’t have everything. Many times I hear people say Festool represents the pinnacle of woodworking tools. Apparently they don’t see that as sufficient reason to sit on their laurels. With improvements like these I can’t wait to see what’s next. As long as you can afford the price, this top tier German tool has my recommendation.